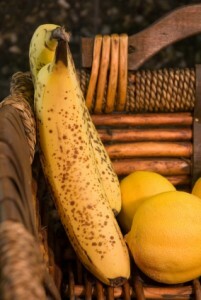 I hate the sight of brown bananas in my fruit bowl or slimy, limp lettuce in the crisper drawer. It makes me feel like I didn’t meal plan properly, and food is too expensive to waste these days. According to Foodwise.com.au, Australians throw away about $5.2 billion of food every year. It’s not only a waste of hard-earned money; it also wastes millions of tons of water and fossil fuels that went into its growth, transportation and storage. Keep your fridge set at three to four degrees Celsius. Don’t over-pack your fridge—if it’s too full, the air can’t circulate properly. Foods with the shortest shelf life (eg. berries, ripe peaches etc.) need to go in the coldest part of the fridge (the bottom). Before freezing milk, remove a little from the carton to avoid the contents expanding and bursting the container. Butter will store longer in the fridge and longer still in the freezer—keep only a few day’s supply on the counter, especially during summer. Create a vacuum pack by sucking or squeezing the air out of the bags you store your fruit and veg in. Exposure to air speeds up the decomposition process. Fresh herbs are best wrapped in a damp paper towel and stored in an airtight container. Herbs can also be frozen in a plastic bag for up to a month. They defrost nearly instantly. Citrus fruits are hardy, so they can usually be stored on the counter for up to two weeks, and much longer in the fridge. Fruits and veggies produce ethylene gas as they ripen; as they absorb the gas they ripen more quickly. Some fruits produce more ethylene than others and it’s good to store these fruits separately (unless you want your other fruit to ripen quickly). Some of the worse culprits include: apples, nectarines, apricots, avocado, rock melon, peaches and pears. Onions and potatoes last longer if stored in a cool, dark place, such as a pantry or cupboard. Found a bad apple? Removed spoiled fruits and veggies to stop others from spoiling more quickly. If you find a bulk bargain on meat, remember to divide the pack into meal-sized portions before you freeze it. Wash fruit and veg just before use. The exception is berries, which can be gently rinsed in a 90:10 mix of water and vinegar before being returned to the container and put in the fridge. The vinegar kills mould spores. Fruit that is too ripe to eat may still be used for cooking. Over-ripe bananas are perfect for banana bread. It’s okay to eat around the rough spots. Small bruises on fruit or specks of mould on cheese can be safely cut off before the food eaten. Never buy a chilled food package that feels swollen. The swelling suggests that the contents inside are going off. Check the use-by date. Keep in mind that food items are often marked down for quick sale because they’re about to expire. Some fresh foods are better than others to buy in bulk. Before you buy a big quantity of fresh produce, keep in mind the longevity of the product, how quickly you’ll use it and if you have room to store it.